Waiting for the delivery of packages from ecommerce giant Amazon may become a thing of the past with the announcement of a new service called “Amazon PrimeAir”. Amazon plans to use unmanned autonomous drones to fly packages to your door in 30 minutes or less after you place an order. In the video released by the company, a pastic container box is packed with your order and sent down a conveyor belt to the drone pickup station where a quadcopter picks up the box and flies it to your front door, all without a person at the controls. 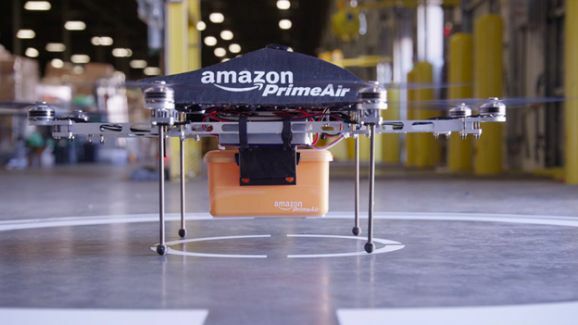 In an interview about the service on CBS’ popular television show 60 Minutes, Amazon boss Jeff Bezos explained that each drone could carry up to five pounds (2.25kg) in the plastic containers, and that the flying machine would be preprogrammed with GPS to find its destination, drop of the package, and then return home to the Amazon warehouse. They can also continue to fly on even if one of the engines malfunctions. Bezos is waiting for FAA approval before he can launch the service in the US, and if a trial goes successfully you can be sure that the service will be rolled out to the UK soon. And just for fun, UK book retailer Waterstones has made a spoof of Amazon’s video with its own Owl delivery service called the Ornithological Waterstones Landing Service (OWLS).